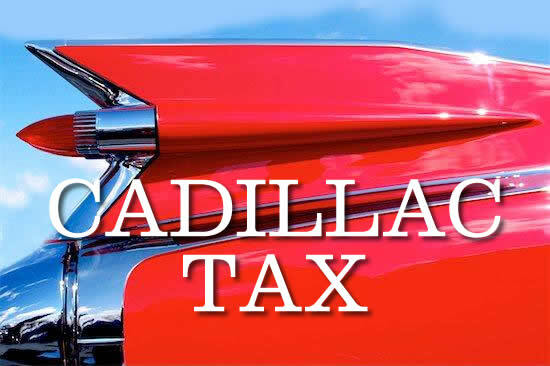 A provision of the Affordable Care Act popularly – or unpopularly – known as the “Cadillac Tax” is getting lots of attention now, even though it doesn’t take effect until 2018. Voices from both parties want quick repeal. And the politics are strange. Briefly, the tax is a 40% excise on high cost health insurance policies that cost more than $10,200 for individuals and $27,500 for families in 2018. It’s 40% on the increment, so an individual policy costing $11,200 would cost an extra $400. It was included to help finance the ACA’s cost and to apply pressure where it hurts the most to restrain the cost of health insurance. When the ACA was signed into law in 2010, many critics asked: “where’s the cost containment?” One answer was: “the Cadillac tax.” The frequent response was derisive laughter: “The tax doesn’t hit until 2018 and it will be repealed well before then.” No laughter now. In 2010, the Congressional Budget Office estimated the tax would generate $32 billion in savings/revenues, 2010-2019; the latest estimate is $87 billion, 2016-2025. CBO projects that savings generated by the tax would come from employers tightening health benefits and paying workers more wages instead, thus generating new tax revenues. Recent estimates suggest more may pay the tax than previously thought. Because the tax is indexed to inflation, which rises more slowly than insurance premiums, it would affect more and more health plans. The Kaiser Family Foundation has a new report on the tax, finding that 30% of employers may be affected by 2023, and 42% by 2028, “if their plans remain unchanged and health benefit costs increase at expected rates.” Therein lies the rub – because no employer wants to pay, they are already trimming benefits, expanding cost sharing, and making other changes. Recent reports suggest that the tax may trigger abandonment of devices such as flexible savings accounts that add to bottom line costs. Also, the tax is blunt and clumsy – the premium targets don’t vary between low and high-income states, meaning northeastern states will feel the impact more harshly. Employers covering older and sicker workers will be hit harder. More generous and expensive union health plans are especially vulnerable. Originally, defenders said the tax would only hit the likes of Goldman Sachs. No more. Opposition is growing fast, joining business and labor as well as Republicans such as Sen. Dean Heller (D-NV) and Democrats such as Rep. Joe Courtney (D-CT). 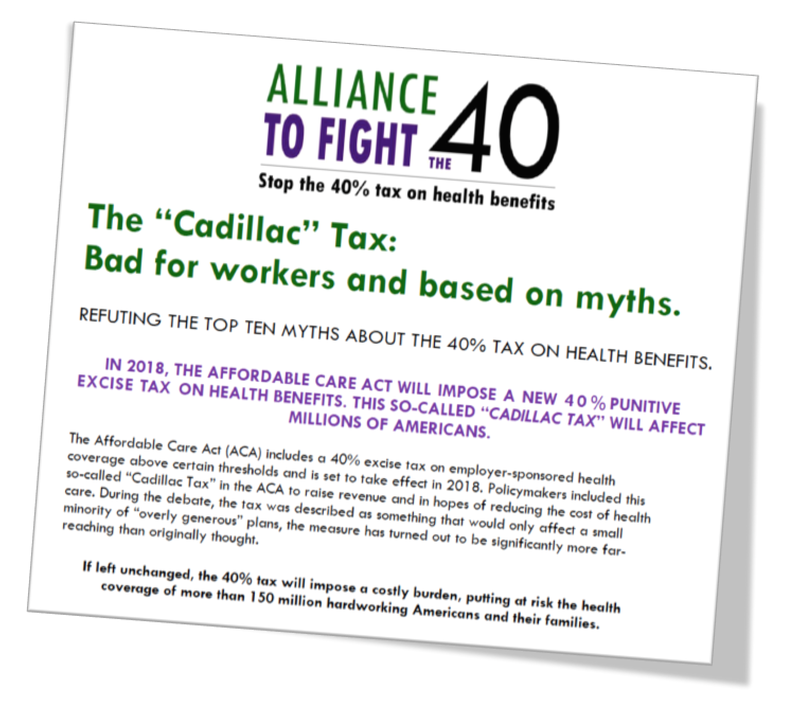 Check out the website of the Alliance to Fight the 40 to see the first volunteers: health insurers, drug makers, and other strange bedfellows. They demand full repeal, not revision. So repeal should be easy, right? Not so fast. Two challenges stand in the way. First, the tax will generate/save $87 billion between 2016-25 and rules require that Congress must pay for it – that’s where Congressional rubber normally crashes on the road. After 13 years of trying, this past April Congress finally repealed the failed “Sustainable Growth Rate” (SGR) physician payment formula in Medicare – though only because Republicans and Democrats agreed NOT to pay the $140 billion tab and toss the cost onto the federal debt. Would they repeat this to kill the Cadillac tax? I’m guessing not while President Obama is in office. Here’s a nightmare. Because Congress could never agree how to finance the 10-year cost of SGR repeal, they enacted a decade long series of inept “doc-fixes” that delayed the SGR and paid for 12-24 months of delay at a time, constantly walking to the edge of the “SGR cliff.” The Cadillac Tax might become the new recurring SGR nightmare. Second, the Cadillac tax, though clumsy and blunt, is an effective federal policy instrument to restrain the growth of private health spending. The new voices for repeal are the familiar ones that demanded strong and effective cost control in any health reform law. They got it with the Cadillac tax and now they want out. Implementing real health care cost control is like cutting government budgets. Most people support cutting public spending on things they don’t care about – and oppose cutting favored programs. Same here – everyone wants health costs controlled until it hits them personally. Republicans who want to limit the federal tax exclusion for employer health insurance should thank their lucky stars no one pays attention to them. If they did, Republicans would flee this position as fast as they fled from the individual mandate, health insurance exchanges (both Republican ideas before abandoning them in 2009) and, yes, the Cadillac tax. My prediction: the Cadillac tax will be modified to ameliorate its most damaging effects, though not before 2017. Next Next post: What Would Republicans Do Instead of the Affordable Care Act?